Pendry Hotels, in collaboration with Brookfield Properties, yesterday announced it has been selected as the hotel operating partner for Manhattan West - an eight-acre, six-building mixed-use development located in Manhattan's Hudson Yards district. Pendry Hotels, in collaboration with Brookfield Properties, yesterday announced it has been selected as the hotel operating partner for Manhattan West - an eight-acre, six-building mixed-use development located in Manhattan's Hudson Yards district. The brand's first New York City property, Pendry Manhattan West, will feature 164 guestrooms including 30 suites; a signature restaurant; a lounge and vibrant open-air terrace bar; and meeting and event space – complementing the defining Manhattan West development that sits directly between the soon-to-be redeveloped Penn Station and the new 7-train station at Hudson Yards. The selection of Pendry Hotels by Brookfield Properties represents the first joint development venture between the two companies. With design and planning well underway, Pendry Manhattan West is expected to break ground in the third quarter of 2018, enabling Pendry Hotels to bring its new luxury offering to the seven-million-square-foot Manhattan West development in 2021. "New York City is a destination we have had our eyes set on for many years, and Brookfield Properties is the ideal partner to collaborate on Pendry Hotels' New York City debut," said Alan J. Fuerstman, founder, chairman and CEO of Montage International. "We look forward to becoming a centerpiece of the community through the hotel's design, amenities and signature service we will provide at Pendry Manhattan West." "The Manhattan West vision of creating a vibrant, 24/7, work-live-play destination comes together with the addition of Pendry Manhattan West to the complex's expansive list of modern amenities," said Ric Clark, senior managing partner and chairman, Brookfield Property Group and Brookfield Property Partners. "We are thrilled to partner with Pendry Hotels because of its strong, aspirational, design- and service-centric brand that will deliver a uniquely modern sensibility and help Manhattan West come alive." Pendry Manhattan West will complement the complex's 844 residential units; more than six million square feet of custom-designed state-of-the-art class-A office space already being populated by a host of leading media, fashion, sports and technology companies including Accenture, Amazon, Ernst & Young, J.P. Morgan Chase and the National Hockey League. A vibrant urban plaza with landscaped gardens and dynamic street-front retail will bring together high-end, experiential shops and innovative culinary concepts, all enlivened with public art and events by Arts Brookfield, Brookfield's award-winning arts and entertainment program. The 250,000 square feet of retail at Manhattan West will be anchored by Peloton, which is creating "Peloton Studios," a 35,000-square-foot state-of-the-art flagship location, and Whole Foods, which is creating a 60,000-square-foot culinary destination. Manhattan West benefits from excellent access to public transportation. It sits immediately adjacent to the soon-to-be-redeveloped Empire Station/Penn Station Complex – the busiest train station in North America – and near the new 7-train station at Hudson Yards, New York City's first subway extension in decades. It is one block from the A, C, E, 1, 2, 3 and 7 subway lines, New Jersey Transit, the Long Island Railroad and Amtrak. 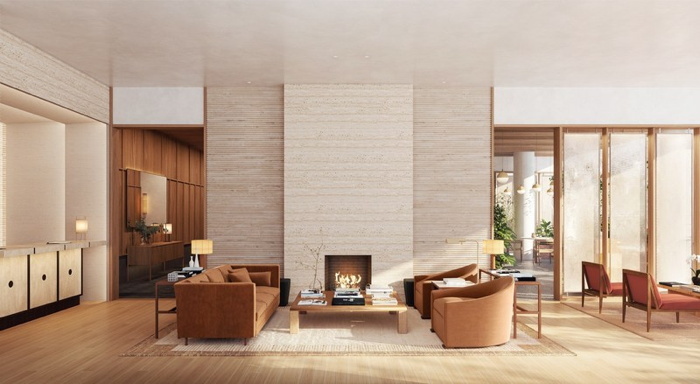 Pendry Manhattan West, designed by acclaimed architectural design firm, , Owings & Merrill with interiors by Gachot Studios, will bring the most compelling aspects of both coasts—California ease and Manhattan energy—to the City. Designed for the modern luxury traveler, the hotel will satisfy the desire for polished comfort, paired with engaging experiences in convivial social spaces, from food and beverage to art and culture. Pendry Manhattan West marks the fourth Pendry Hotels announcement and follows the openings of Pendry San Diego and Sagamore Pendry Baltimore. Are you with Pendry Hotels? If you are a member of Pendry Hotels you may be interested in learning how to optimize your content on our network.